Multiple sclerosis is a chronic, disseminated inflammation of the central nervous system which is thought to be driven by autoimmune T cells. Genetic association studies in multiple sclerosis and a large number of studies in the animal model of the disease support a role for effector/memory T helper cells. 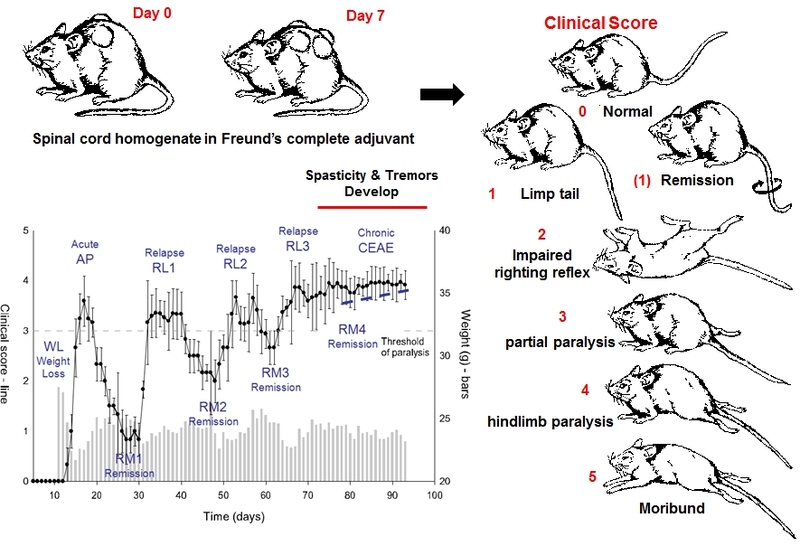 However, the mechanisms underlying relapses, remission and chronic progression in multiple sclerosis or the animal model experimental autoimmune encephalomyelitis, are not clear. In particular, there is only scarce information on the role of central nervous system-invading naive T helper cells in these processes. By applying two-photon laser scanning microscopy we could show in vivo that antigen unexperienced T helper cells migrated into the deep parenchyma of the inflamed central nervous system in experimental autoimmune encephalomyelitis, independent of their antigen specificity. Using flow cytometric analyses of central nervous system-derived lymphocytes we found that only antigen-specific, formerly naive T helper cells became activated during inflammation of the central nervous system encountering their corresponding antigen. There is a debate ongoing about the value of EAE. There are now a number of immune modulators and it is going to be increasingly difficult to develop new ones as you are going to have to go head to head against a current DMT. Do we need more….of course we do. However, in terms of basic science how much do we need to do in EAE, to understand basic biology when we could probably get the same idea by using a less severe model? This is the basis of the 3Rs which a central part of EU law when it comes to use of animals in research. Somebody a couple of days ago extolled the virtue of German ethics but for any piece of work you can take a view in favour or against. I know there are many people reading here who are against..
One could pose the question, how often do we need to re-invent the wheel with new technology to tell us something that we essentially believe we know already? When a cell sees it target, it can get activated! It is very clear that most cells that arrive in the CNS, do so not because of their antigen-specificity, this was shown over thirty years ago. We know their migration markers that they make are important and that is why we have natalizumab and fingolimod. We know that the previously antigen sensitizied pool is important in EAE induction. We are spending vast amounts of time working out where the immune cells go, eg. Lungs spleen brain and out again, but if a cell goes into a tissue it can die and we can make a new one to go elsewhere. Or does it move out of the CNS to live another day? Two photon microscopy (see education) is a powerful tool in science and there is an argument that can be made that new knowledge is being generated. The question is where should we draw the line with regard use of animals used in “severe proceedures”. In the UK the view has increasingly being the furry friends remain friends. This is a very real question, Do we have a blanket ban? or a blanket its OK? What do you think? This is the first paper that could be used to address the point made by one of the commenters…So not selcted for special attention. I love furry friends, all kinds. I feel intense sadness when I watch the 1980s lab animal rescue videos. I smiled the other day when I read a 'news' story about a cow escaping the live exports ship and swimming to freedom (Free Willy Moo!). Still, I'm not a vegetarian and I salivate at a thought of a bbq. To me, the only ethical dilemma is how to help people with MS quicker. So the only ethical answer to how we go about understanding biology and pathology is to do both (using furry friends in severe procedures and a less severe model) and see which is quicker, as long as there is enough utility to warrant the exercise. I’m against animal research for make-up, unless the make-up is to meet a medical need such as covering scars safely as its primary goal (ha)! There are so many unknowns and limited tools in real time for humans with MS, there seems plenty of utility in contexts of both animal research ethics (severe procedures and less severe models) and trialling DMTs with new trial designs on people with progressive MS and in wheelchairs. Time is brain, after all, and behind each brain there is a living worthwhile loving frustrated loved human being facing very real limitations and social exclusions. The only blankets that should be around are near the bed at home. Other than this and my life long non vegetarianism, my love for furry friends can’t be faulted: my family has frequently accused me of being an animal and human rights fighter since I was five (and in exasperation more often than love or admiration). how often should the wheel be re-invented with new technology to tell us something that we essentially believe we know already? – each time we realise, for rational reasons, that the old technology let us down in some way in some area that may muddy what we thought we knew about MS. Realistically, how often does that happen? #ResearchSpeak: MS prevention can we make it a reality?